What is the most effective way to increase customer retention? - Just give them the reason to come back. Since customer can have many ways to gain points, this feature helps encouraging customers to keep coming back for earning more points, which eventually make them purchase more on site to redeem those points. Additionally, this will help increase the customer's interaction to website. This feature allows customers to earn points when they refer any friends to visit, sign-up or purchase on the website (for both first and subsequent purchases). Customer can easily take their own referral link from their account and share your web store with friends via social networks (Facebook, Twitter, Google...) This is a great way to widen up the customer network and encourage them to interact more on the website. Admin can show the reward points information on many places on Website: Category pages, Product pages, Registration page, Signup blocks, Newsletter block...). Details about number of points rewarded are also shown on Shopping cart page/Order review. With this, customer will always be notified about the current points programs and never worry about missing chance to get points again. With this extension, customers can get discount on their purchase by using current points, and at the same time, earn more points which can be spent on the next orders. Besides, customers can manage the amount of points to spend on the purchase by using the point slider right on the Shopping Cart/Checkout page. They can decide to use all the points in account or just a specific number of points as their preference. Reward Points Pro for Magento 2 allows admin to set different earning rules based on Catalog Rules, Shopping Cart Rules or set fixed points earned for each specific product. The amount of points earned can be fixed number or can be set by a rate (E.g: Earn 10 points for each 1$). Admin can flexibly track the point account and point transaction history of all or specific customers. Besides, Reward Points Pro for Magento 2 also allow admin to edit the point balance of customer by adding or subtracting points with comment right from the back-end. This extension has the function of importing customer's reward points in bulk via CSV file. It helps admin to edit the points balance of customers in mass. With this function, admin can also easily import the points data of other point system to Reward Point Pro for Magento 2 by using just a CSV file. The label and icon of the point unit can be simply changed by uploading the custom designed image for points in the Configuration. Admin can free call "point" by any interesting names possible, depending on the branding or events purpose. Thank MageWorld! Your extension work well with my website. Will recommand for my partners. Thank MageWorld team! I will recommend you for my partner. I had the Magento 1 module and upgraded to this module. Mage-world helped with some css to match my theme. The module is easy to config and enough rules for you to be able to do anything. The only think I don't like are these banners that pop up when anyone does anything cart related that span across the website. "for using points,log in." These banners even pop up in the admin section when creating orders. Very much a nuisance, and hopefully will be removed in future versions. Q. Can I set and run different reward point rules at the same time? A. 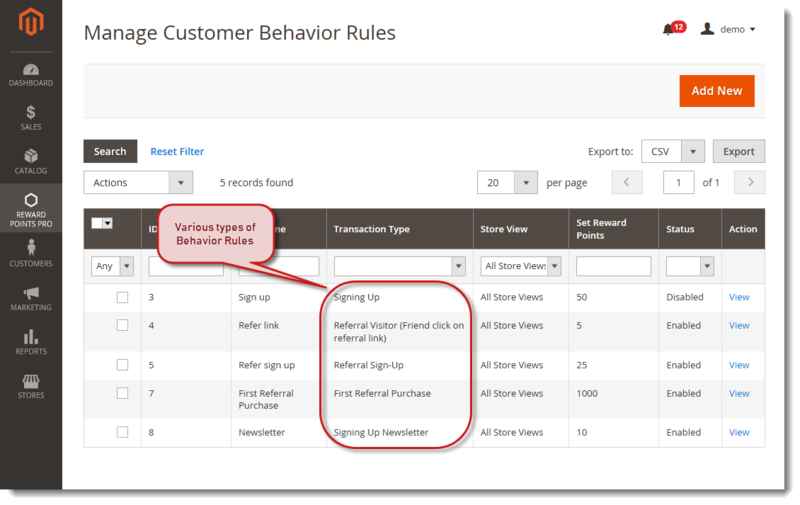 Yes, you can set as many reward point rules as possible and you can even set the priority for these rules to avoid too many rules being applied for the same product. Q. How can customers check their point balance? A. Customer can totally login to their Account and go to My Account --> My Reward Points to check for their current point balance and Transaction History. Q. If I already used another point system before, can I still use my old data when switching to MageWorld Reward Point Pro for Magento 2? A. Sure, if you are switching to from another point system to our extension, you can totally import the point balance of all customers via CSV file to continue using on this extension. Q. Which One Step Checkout extension will be compatible with MageWorld Reward Point for Magento 2? Q. How exactly can I set my own custom points label and icon for the website? A. To set this up, please login to your admin account and go to Reward Points Pro --> Configuration and change the label and upload the icon image in Display Configuration. Q. Is it possible to customize this extension to add more features? A. Yes, all of our extensions are open-source so you are totally able to customize it any way you want. Besides, we also provide the Professional Customization service; thus, if you have any requirement, just don't hesistate to contact us here. + Fix bug sql injection. 3. Go to backend and access to menu Reward Points Pro to manage your rule and change config as you wish.